1:00 PM Arrive at the playground with Jas and Vincent. 5:00 PM Leaves the playground to walk Jas and Vincent to Emily's house, 2 Willow Lane. 6:00 PM Arrives at Emily's house, where the three talk. 11:00 AM Continues moving around her trailer. 1:00 PM Moves around the trailer and does some dishes. 3:00 PM Sits on the couch in the trailer. 6:00 PM Does some reading in the trailer. 8:10 AM Wakes up and walks to the Museum to sit outside. "I'm going to go inside, I just wanted a quiet moment." "それもまた人生の一部じゃないかな。" (友好度は変わりません) 彼女は答えます、"You're right, we shouldn't ignore the reality of aging. I guess the sooner we come to terms with our mortality, the more time we can spend really living in the here-and-now." "死ぬんだったら若いうちがいいよね..." (友好度は変わりません) 彼女は答えます、 "That's a horrible thing to say. Life is a precious thing to waste like that!" "(嘘) うん! すごくおいしい!" (友好度+50) 彼女は答えます: "本当? ありがとう! ... その言葉をきけてほっとしたわ。 すごく一生懸命このレシピを考えたんだもの。 ねえ, あなたがはじめてこれを試食した人なの, この料理の名前は 'チリ デ <あなたの名前>'にしましょう！"
"あんまり考えたことなかったな。" (友好度は変わりません) 彼女は答えます、"Oh no? Well, I guess that makes sense... you're busy with other things right now." "当然あるよ。大家族がいいな。" (友好度+20) 彼女は答えます、"... Me too. I'm glad you feel that way." "思わないな。世界に人はじゅうぶん足りてるよ。" (友好度-10) 彼女は答えます、"hmm... If everyone thought like that, humans would die out." "思わないな。家族にしばられたくないんだ。" (友好度-10) 彼女は答えます、"Oh... That's kind of sad... but I guess I can understand your point." "私も君と同じことを考えていたよ。" (友好度は変わりません) ペニーは, "...ああ, <あなたの名前>。私もそうじゃないかとは思っていたけど、自信が持てなかったの。 ...私、今夜のことは忘れないわ。 あなたは今夜はとっても素敵に見えるわ... わたし... *ため息*" あなたはキスをし、場面は終わる. Once married, Penny will move into the farmhouse and begin working at the museum on Tuesday, Wednesday, and Friday. 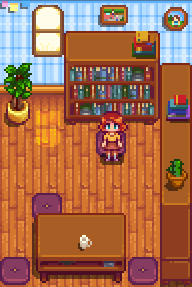 Like other marriage candidates, she will add her own room off to the side of the bedroom, which happens to be a small library. She'll also setup a small potted plant garden behind the farmhouse where she'll go to read. 2: She will also occasionally cook you breakfast, adding one random breakfast food to your inventory. If your inventory is full, you will not receive the item. 4: Give you a Stardrop as a sign of love. Get your Penny to 13/12 hearts and speak to them in your home. 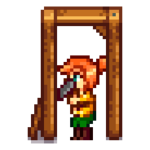 She will comment about life on the farm and how they are enjoying it, then give you the Stardrop Fruit as thanks. "A word of warning, my mother really hates 'Squid'. Just the thought of it can make her depressed." "But it's best not to dwell on bad things, right?" Right. It's best to be positive! "That's how I feel. I'm just going to focus on making the future better." I think it's good to be realistic. "Maybe you're right. It's better to cope with reality." "I just saw a songbird flying due west. 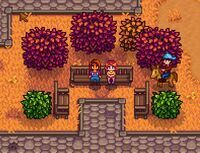 In Stardew Valley that's a very good omen." "I'm really happy on our little farm, [Player]." "Isn't this the perfect place to raise children? I would've been so happy growing up on a farm." "Hmm... skirt or pants tomorrow? Oh, who am I kidding... I always go with the skirt." "A nice house, two wonderful kids, and a beautiful plot of land. We're so very fortunate." Note: This dialogue will only play if you have two children. "This is a lot more peaceful than my old spot in town. I'm very happy here." This dialogue will play when Penny is reading in her garden. "Don't worry about me... I know you've got a lot of responsibilities outside of the house. I'm fine in here by myself!" "I have to go into town today. Don't work too hard, and eat something good for lunch!" "I'm going to head into town today, just for fun. I'll be back in awhile!" "Good evening, honey. Did you accomplish everything you wanted to today? If not, that's okay. We've got all the time in the world!" "Good evening. My day was fine, thanks! How was yours?" "I had a nice time... It's good to stay in contact with everyone. Tell me about your day." "Jas and Vincent weren't behaving well today. I'm still all wound up..."
"Ready to tuck in? I made the bed and everything..."